Silver Creek Real Estate Group announced today that its global real estate network, Leading Real Estate Companies of the World®, continues to lead the industry in sales, with $372 billion in U.S. home sales in 2017, $55 billion ahead of its closest competitor. 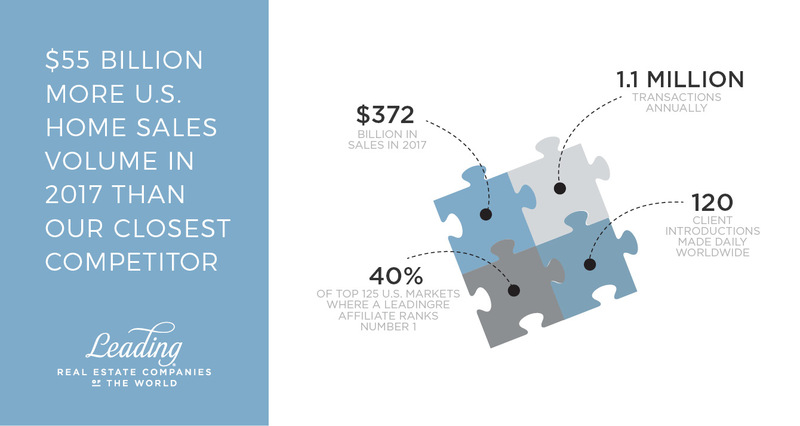 Among the top 500 U.S. real estate firms, LeadingRE was responsible for more sales units than any other group, with 24.5% of the total units, totaling 1.1 million transactions. LeadingRE is the largest network of top independent residential real estate firms, and network affiliates are widely recognized as the premier providers of quality residential real estate and relocation services. As a member of LeadngRE, Silver Creek Real Estate Group is aligned with 565 market-leading brokerages in over 70 countries and has access to award-winning professional development programs and events, innovative technology and marketing resources, industry-leading referral network and connections to people and opportunities worldwide. 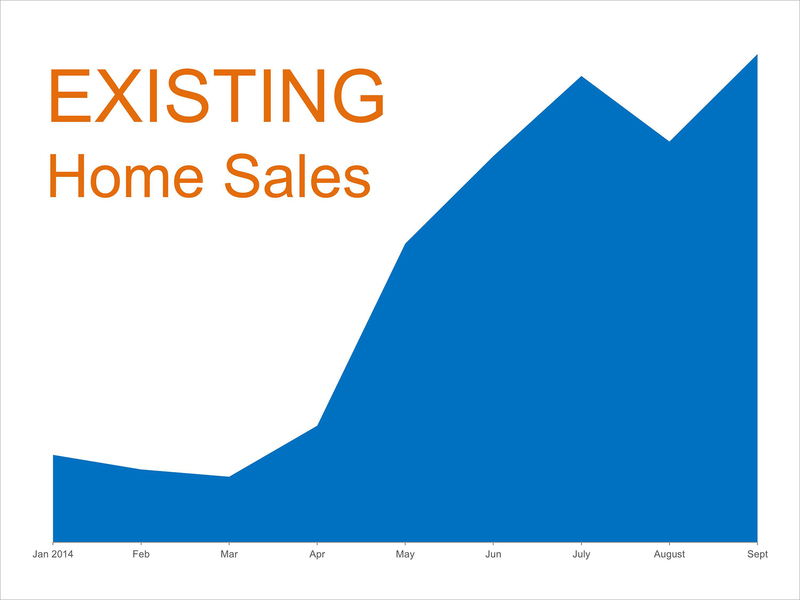 The National Association of Realtors (NAR) released their Existing Home Sales Report earlier this week. The report revealed that sales bounced back in September to their highest annual pace of the year. As the chart below shows, after a very slow start at the beginning of the year, residential home sales have been increasing nicely. "I still think, from an individual perspective, the best deal investment you can make is to buy a primary residence that you're the owner-occupier of. A multibillionaire hedge fund operator and the investment genius. 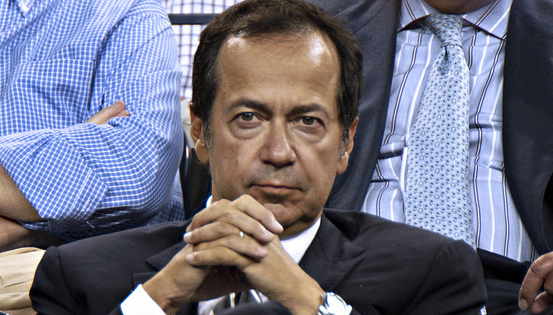 A hedge fund tycoon who made his name, and a fortune, betting against subprime mortgages when no one else even knew what they were. Whenever a billionaire gives investment advice, people usually clamor to hear it. This billionaire gave simple advice if you dont yet live in your own home, go buy one. In todays competitive real estate market, the person who buys your home is likely to come from a different town, city or even country. More than ever, success in marketing your home results from casting the widest net. Marketing a property outside of the Highlands-Cashiers Plateau takes more than local expertise; it requires global connections and, of course, powerful marketing. As an affiliate of Leading Real Estate Companies of the World, Silver Creek Real Estate Group has the resources to market your home to the highest possible number of potential buyers. By tapping into the network of 140,000 talented sales associates around the world, we can expose the homes we represent to buyers on six continents, ensuring there are more eyes on every property. In addition, Silver Creek Real Estate Group receives inbound clients from other affiliates around the globe who are interested in purchasing a home in this area. Leading Real Estate Companies of the World is a pedigree denoting the very best companies that represent qualified clientele and wish to do business with similar firms. Each year this network is collectively responsible for over 920,000 transactions globally. When a home is listed with Silver Creek Real Estate Group it is posted on our website at ncliving.com locally and is immediately promoted on LeadingRE.com, which provides access to over 2 million listings. It also appears on the websites of over 500 affiliated real estate firms around the world. The Leading Real Estate Companies of the World advantage ensures that when selling a home on the Highlands-Cashiers Plateau, Silver Creek Real Estate Group can deliver regional and global exposure in addition to the strong local marketing expertise for which youve come to know us. Visit us at ncliving.com for more information today. Silver Creek Real Estate Group is a member of Luxury Portfolio International, the fastest growing luxury property network, with more than 200 affiliate companies around the world and more listings over $1 million than any other luxury real estate organization. 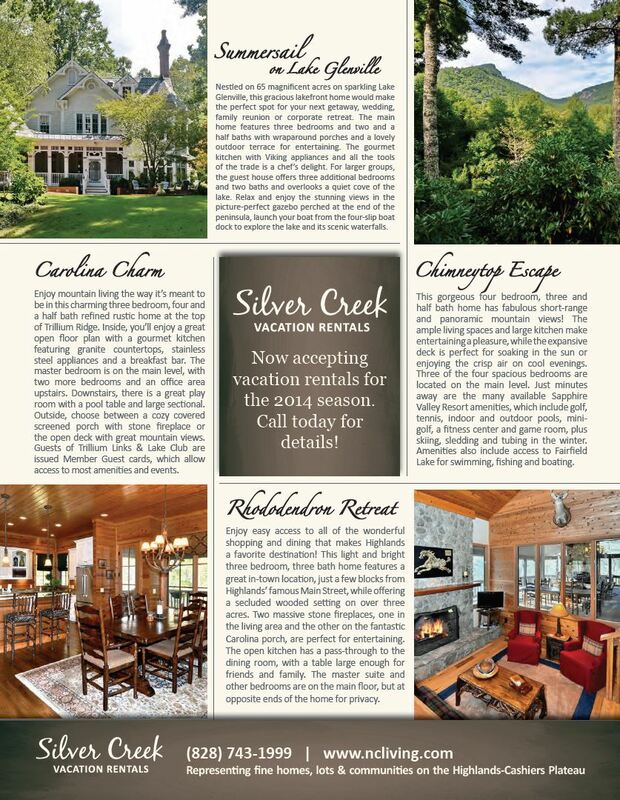 Luxury Portfolio is delighted to have Silver Creek Real Estate Group as part of our distinguished Broker Collection. The company has an impeccable reputation for luxury marketing in Cashiers, Highlands, Sapphire, Lake Glenville and Lake Toxaway, and we are committed to helping them achieve even greater success, said Paul Boomsma, president of Luxury Portfolio. Luxury Portfolio boasts the most comprehensive marketing program in the industry, encompassing print advertising in high net-worth publications, an award-winning website and premium marketing materials. The scope of the program benefits Silver Creek Real Estate Group and their agents, as well as the luxury clientele they serve. Silver Creek Real Estate Group has an extensive collection of properties over $1 million and is a leading real estate firm on Highlands-Cashiers Plateau. "said Jochen Lucke. Luxury Portfolio International markets over 25,000 properties of the worlds most remarkable properties annually on its award-winning website, www.LuxuryPortfolio.com. The site attracts over 1.2 million high-net-worth visitors a year and features a total inventory of available properties in excess of $41 billion. 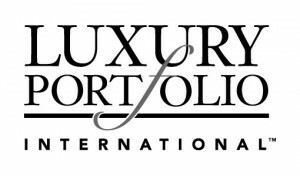 Luxury Portfolio is unmatched in the global arena, with members in 30 countries, site translation in nine languages and multiple currencies and visitors from 200 countries/territories visit the site every month. As a member of Luxury Portfolio International we are able to provide you the latest issue of LUXETRENDS a newsletter with articles on real estate trends, home furnishings, design concepts, luxury destinations and more. Please click on the link below for the latest issue! If you are buying or selling a luxury home in the Cashiers, Highlands, Sapphire Valley, Lake Glenville and Lake Toxaway area, Silver Creek Real Estate Group is just a phone call away. Call us today at 828-743-1999! Silver Creek Real Estate Group is proud to continue its support of the Tour de Cashiers in 2012. This year's event will be held on May 5th. The Tour de Cashiers was started as a community ride by Clark Moore in 1992. There was one 11-mile route, and folks met in front of the Chamber of Commerce. It stayed this way for a couple of years. Then over the years, with the help of several local cyclists, the Tour was expanded to include multiple and longer rides, and post-ride food and entertainment. In 2001, a 75-miler was added to bring new challenges and to appeal to riders looking for something more. The full 100-mile Century was added in 2004, and in 2006 the 50 and 75-mile rides were combined into a new Metric Century. The two century rides provide challenge and inspiration for riders wanting to tour the mountains and test their conditioning on an all-day supported ride. Tour de Cashiers events are now being presented by the Highlands-Cashiers Hospital Foundation. We put all net proceeds back into the community through donations to our local hospital and to such organizations as the Cashiers/Glenville Volunteer Fire Department, the Glenville/Cashiers Rescue Squad, The Village Green and other area fire and rescue departments and local schools. The Jackson and Macon County Sheriff Departments help with leading or protecting the ride, and fire and EMS units from three counties are either on the course or on call. Many volunteers run the rest stops and keep riders stocked with fruit, bars, energy drinks and water. 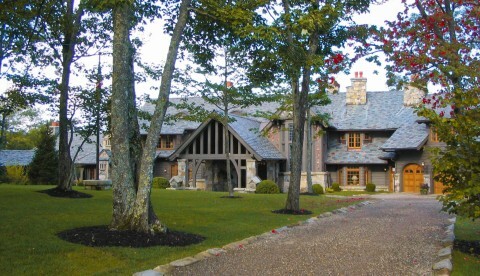 Sagee Manor in Highlands, North Carolina is truly a masterpiece of architectural, interior and landscape design. Created by renowned architect Keith Summerour, this magnificent seven bedroom estate sits on almost 22 acres, with additional acreage available. 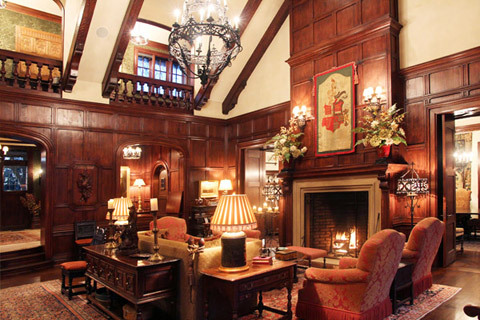 The levels of craftsmanship and artistry found in Sagee Manor are unsurpassed in the Highlands area. Perched atop the southern plateau of the Blue Ridge Mountains, Sagee Manor offers stunning long-range mountain views in every direction. The estate's elevation of 4,200 feet ensures that its owners, family and friends may enjoy the cooler summer temperatures afforded to residents of the Highlands/Cashiers Plateau. 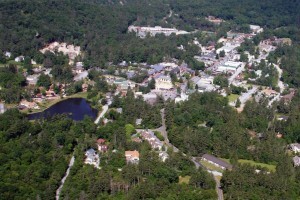 The vibrant village of Highlands with its breathtaking mountain vistas, mesmerizing waterfalls and wooded forest draws second-home owners from across the country and visitors from around the world. Highlands is known for its quaint inns, upscale shops and renowned eateries, as well as its excellent private golf and country clubs. Silver Creek Real Estate Group is pleased to present such an exceptional property as Sagee Manor. For information and to schedule a private tour of this magnificent mountain estate in Highlands, please contact Jochen Lucke at (828) 226-1126 or via email at jlucke@ncliving.com. For additional information about the greater Highlands - Cashiers area, or other fine properties currently being offered for sale, please visit us at www.ncliving.com. Let our experience and knowledge guide you in the purchase of your mountain retreat.